The Chicago Association of Black Journalists (CABJ) is dedicated to the support, recognition and professional advancement of African Americans in the news industry. 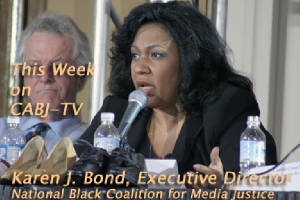 Founded on July 15, 1976, CABJ brought together black media representatives in Chicago to encourage expanded, in-depth coverage of the African American community. Our guests this Monday are Cook County Commissioners Deborah Sims and Jerry Butler. Tune in to Chicago Cable Access channel 21 at 6:30 p.m. and join us as we discuss Cook County Board President Todd Stroger's proposed tax increases for the 2008 Cook County budget. Are You Ready for DTV? The Russ Ewing Awards and Scholarship Presentation is our annual fundraising event where we salute our colleagues, the local media and award scholarships to deserving college level students aspiring to careers in journalism. For more information click here.